The first Europeans to get remotely close to Massachusetts were probably Vikings from Iceland. 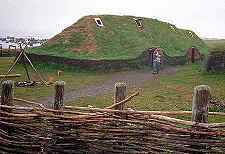 There is archaeological evidence of a 1,000 year old Viking settlement at L’Anse Aux Meadows in northern Newfoundland. No permanent settlement survived. They may have come earlier, but the first records of European stopovers in the search for Cod and whales are from the 16th century. European travel to and around Massachusetts picked up to near traffic jam levels by the 16th century. A rush for a Northwest passage to the Orient and gold starting in earnest with Columbus’s return to Europe from his 1492 voyage. It was thrown into high gear after Pissaro’s conquest of the Incas and their gold in 1532. Europeans (Basques, English and others) were first drawn to the New England area for its rich supplies of Cod and whales. European rivals also began to seek out areas of the newly rediscovered continent from which they could export a high-value crop unavailable at home such as sugar or tobacco. Neither, of course, were to be found in New England but many would have sailed past Massachusetts (Verranzo, Cartier, Hawkins) and it is likely some would have anchored for fresh water and supplies. *In 1607 transported a group of 100 Englishmen to found a colony at the mouth of Penobscot Bay (Maine)–rivaling Jamestown for the title of oldest English settlement in North America. Abandoned within a year. **Left Jamestown, VA in 1609 for England; returned to explore the coast including Penobscot Bay and Cape Cod (1614?). He reported some French traders who had visited what is now Boston Harbor prior to his visit. He was the first to apply the names Massachusetts and New England to these regions. His narrative “Description of New England”, his maps and other communications portrayed an enthusiastic portrait of New England. **Took Squanto (Tisquantam), who would become the Pilgrims’ translator, from Newfoundland to assist with navigation of Massachusetts shore. He took him to England and returned him to Plymouth in 1619 where they found Indian villages wiped out by disease. By the time the Pilgrims arrived in Massachusetts, there had been more than enough European pathogens brought onshore to thin the native population—sometimes wiping out entire tribes or villages. And there were enough Europeans seeing/touching Massachusetts to spark controversy about who could lay claim to it. Significantly, most claims were “sea to sea” . *The First Frontier, The Forgotten History of Struggle, Savagery and Endurance in Early America, Scott Weidensaul, Houghton, Mifflin, Harcourt, 2012 (See “Part I”) for some fascinating descriptions of early encounters between New England natives and early European visitors.